On 20th February 2017, Kamlesh, a Soochna Seva worker received a tip-off on the rampant black marketing of ration happening in the Ward no. 19, Weaver Colony, Khatipura, Jaipur. The area dealer was stocking the food materials and deserving community members were forced to buy food items from the open market. The poor were unable to afford open market prices and were left malnourished. The rich in the area were reported to be buying off food items on payment of bribes. Shishir and Kamlesh, Soochna Seva fellows, decided to fix the issue and went in the area for more investigation. 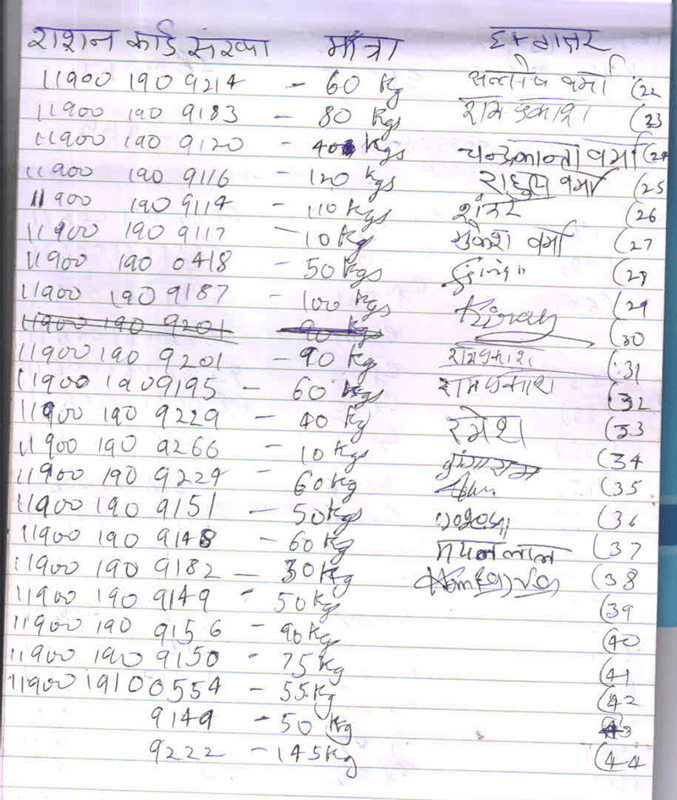 The following observations were made by them about the inconsistencies in the ration distribution. 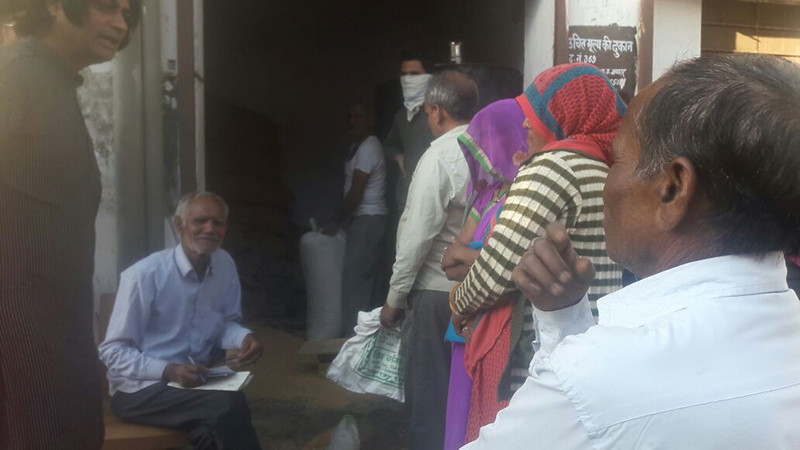 Ration dealer opens shop for just 4-5 days in a month and for about 2 hours per day. Ration dealer goes door-to-door in the area and takes thumb impression of registered candidates against the promise of ration delivery in the next month. All this transaction happens without any written document or receipt. If anyone asks for the receipt, dealer tells them to collect it from the shop later. The community members informed Soochna Seva that dealer is never available at the shop and the guy who sits to fill in his position always give lame excuses- like the no paper roll in machine, server is down or slip is stuck – in generating a proper receipt. Very poor quality wheat is being distributed by the ration dealer. 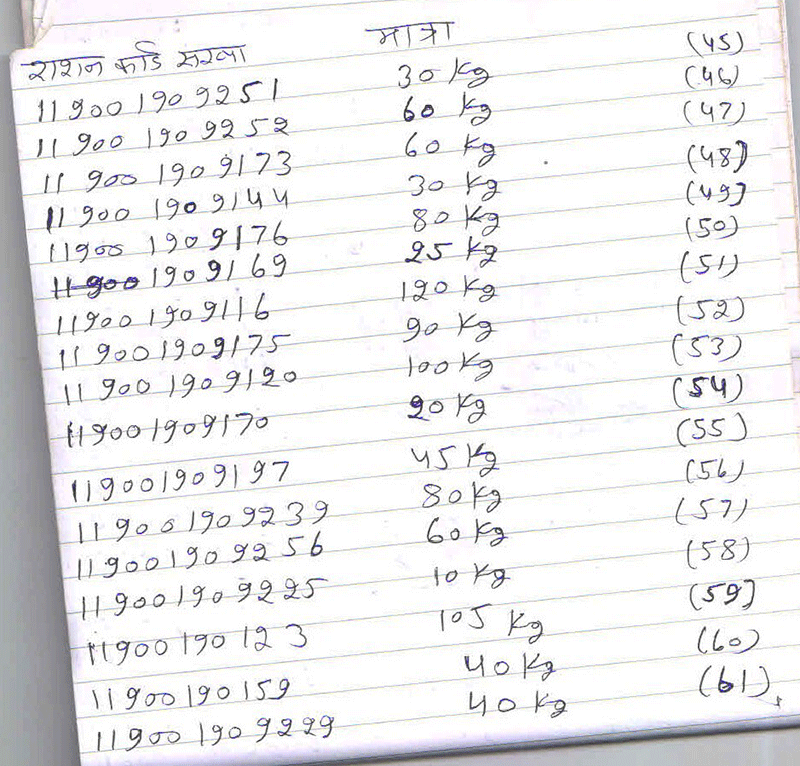 The ration dealer distributes 10 Kg wheat per family, whereas the quantity of ration (wheat) per person is 5 kg/month per person by the government. This hurts marginalized section and it doesn’t matter if the family has 2, 5 or more members they will just get 10 Kg wheat. The dealer is practicing this molestation of rules and regulations since last 6 months. 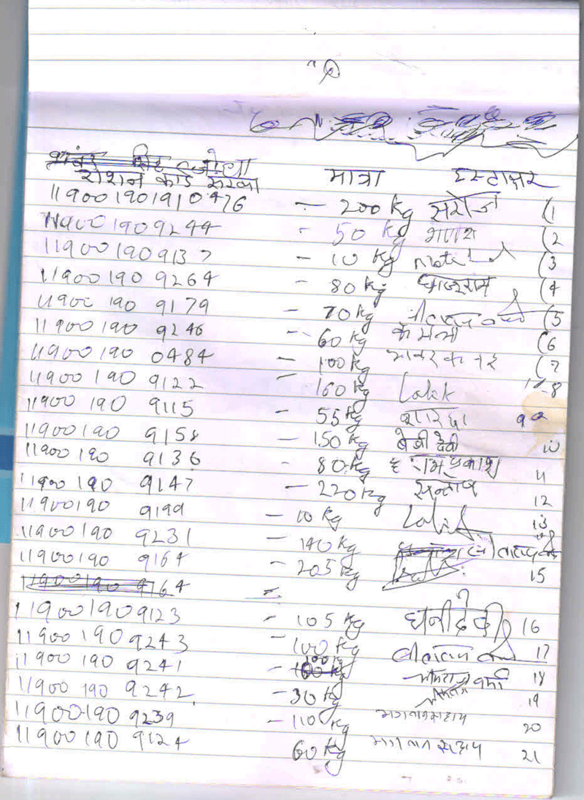 Further investigation showed that 2 registered beneficiaries with card number -119001909175 and 119001909176- were unaware of the fact that their share of ration was being blatantly stolen by ration dealer. Their details on raj.nic.in reflected that beneficiaries have raised their share of ration but in reality none of them have received any food supplies. The ration dealer was allegedly lifting their share of ration and was messing up with the biometric thumb impressions of the beneficiaries. This is a matter of digital collapse as biometric machines used at ration shops fails to prevent black marketing of food items. This is a subject of the police inquiry. The Soochna Seva team to constitute a comprehensive analysis met more community members and documented their complaints. 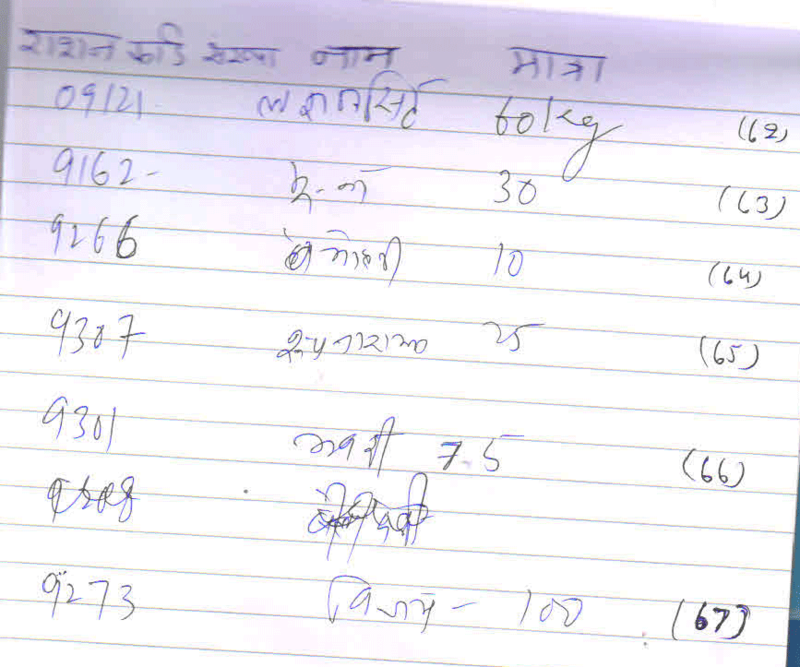 All these participants online ration details were carefully checked, individual data was found out to be highly inconsistent with the delivery of ration delivered to them in person. It was clear that the people are being cheated and there is a nexus between ration distributor and the local counselor. The team along with community members confronted ration distributor. Initially, he denied the charges leveled against him but later succumbed to the collective pressure especially when the team produced online details proving his crime. He accepted to compensate the stolen ration with all the concerned population of the area. 22ndFebruary was fixed as the date to distribute the pending ration but the news of this development spread like a wildfire in the neighborhood and around 70 residents came and got their 7-8 months overdue ration within 2 days. The total food items distributed were weighed to be around 4700 Kg. Later, the youth in the area were trained to extract online ration details on their smartphones to avoid any possible exploitation by the dealers in future.